Hardwood Floors: Timeless and classic hardwood floors can last a lifetime. Offered in both traditional wood and new laminate options, wood flooring gives a classic and clean look to any room. Wood floors are ideal for homeowners who reside in warmer climates, those who suffer from allergies and homeowners looking to add value into their homes. Hardwood isn’t without drawbacks however, you’ll need to use protector pads to protect your floor from scuffs from office chairs. Also, polishers and cleaners may give off faint odors if you choose real wood. You can expect to furnish your office with an area rug as well to decorate the room. Hardwood floors will also transfer sound through floors – something to keep in mind if your office is on the second floor, and you have a tendency to pace. Carpet Flooring: Carpet is an excellent choice for those who prefer durability and choice of color. Modern durable carpets can last for decades looking brand new. 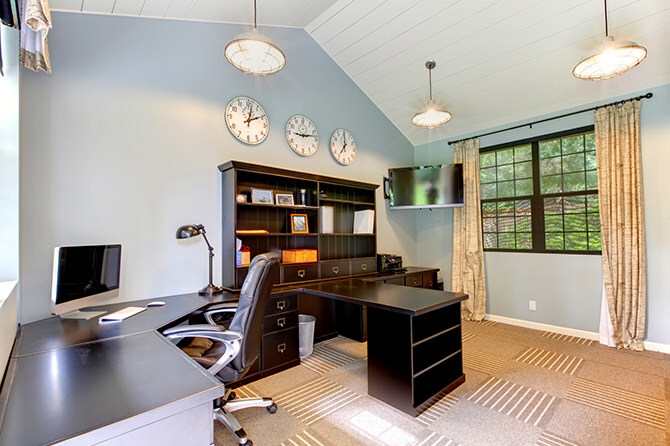 Choosing carpeting also means you’ll enjoy designing your offices color and theme. Soft and easy to clean, carpets need only vacuuming to keep them looking new. So, there is no need to use harmful chemicals. Non-durable carpeting will still wear quicker than hardwood floors. Carpeting will also harbor more dust and allergens that traditional wood flooring prevents. Lastly, if you plan to sell your home, buyers may be more hesitant to purchase a home with carpet – more so than homes with hardwood floors. The choice between carpet and hardwoods is a personal one, what works for one buyer isn’t always best for another. Our trained staff will be happy to assist you with a free measurement of your space and with finding the perfect flooring for you needs. As always our quotes and measurements are free. Call or stop Rembrandt Flooring today.